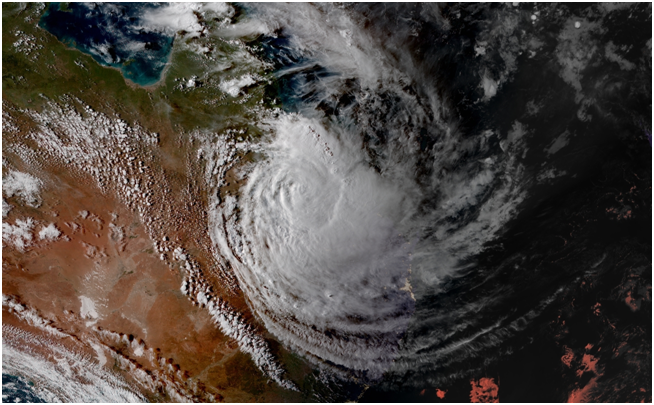 Cyclone Debbie made landfall over the coast of Queensland Australia on Tuesday producing severe wind damage to properties in areas close to the eye including the towns of Bowen and Proserpine. Debbie gradually moved inland and as winds eased the cyclone was downgraded to a tropical low pressure system. However, heavy rain has continued particularly to the south of the low centre where winds were blowing inland from the ocean. Some remarkable rainfall totals have been recorded in the Clarke Range mountains located some 30 km from the coast. In just over three days Mount William has recorded over 1300 mm (51”) rain. Even at lower levels rainfall totals of 250-500 mm (10-20”) have been widely reported. This is likely to result in flooding over the next few days as the rainfall works it’s way through river catchments. Ex-Cyclone Debbie is now turning south-east and is expected to move back towards the coast and out to sea over the next 24-36 hours. The Bureau of Meteorology has issued weather warnings for an area over 1000 km in length from Bowen in the north to Brisbane and the Gold Coast in the south. Daily rainfall totals of 150-250 mm are possible with higher values in some localities causing major river flooding. Latest warnings on flooding in Queensland caused by ex-Cyclone Debbie and official warnings for the latest tropical cyclones in the Australian region are issued by the Bureau of Meteorology. The Met Office routinely supplies predictions of cyclone tracks from its global forecast model to regional meteorological centres worldwide, which are used along with guidance from other models in the production of forecasts and guidance. We also provide updates on current tropical storms via @metofficestorms on Twitter. This entry was posted in Met Office News and tagged Australia, Australian Bureau of Meteorology, Brisbane, Cyclone Debbie, flash flooding, flood, flooding, heavy rain, Queensland, rain, rainfall, Storm, storms, strong winds, tropical cyclone. Bookmark the permalink.